The Comprehensive and Progressive Agreement for Trans-Pacific Partnership (CPTPP) has been officially ratified by seven parties – Mexico, Japan, Singapore, New Zealand, Canada, Australia and Vietnam – and will enter into force on 30 Dec 2018. Companies will be able to benefit from substantially tariff-free export of goods to CPTPP markets, enjoy preferential market access to services sectors in CPTPP markets, and gain access to government procurement opportunities, just to name a few. 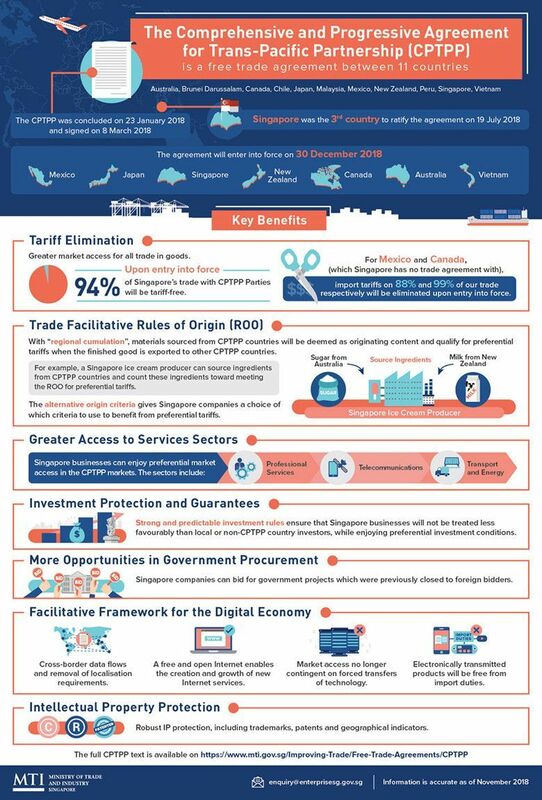 Find out more about the CPTPP from the infographic below or contact enquiry@enterprisesg.gov.sg for more information.